This reality game show puts participants under the scrutiny of a lie detector test in their quest to win a half a million dollars. The challenge seems easy. Just answer increasingly personal questions honestly, as determined by a polygraph, and win up to $500,000. In fact, it’s the only competition show where participants know both the questions and the answers before they start the game. Prior to the show, contestants are strapped to a lie detector and asked over 50 questions by a polygraph expert. Without knowing the results of the test, the person is then asked 21 of those questions during the show, each becoming progressively more personal in nature and is worth more money. If the contestant answers honestly (as confirmed by the polygraph), he/she moves on to the next question. 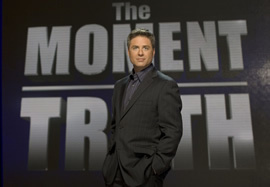 If polygraph determines the person has lied or if they refuse to answer a question after it’s been asked, the game ends and the contestant loses all of the prize money they’ve accumulated. The sensitive questions become all the more difficult to answer because they often must be answered in front of spouses, relatives and friends. What deep dark secret will someone divulge for a chance to win $500,000? The series is hosted by Mark L. Walberg. I love this love and hope very much that you do not cancell it.If people want to go on tv and think that they can beat the lie detector then let them.I and my whole family love this show and will be very disappionted if it is cancelled.